Honor our country’s oldest national park with new National Park Two Dollar Bills from the New England Mint. These enhanced and uncirculated full color two dollar bills are available exclusively for just a limited time. Two dollar bills are among the most beautiful and rarest of US circulating currency and now they are even rarer with an exclusive overlay of America’s National Parks. The Yellowstone National Park $2 Bill honors our nation’s very first national park in glorious color and Thomas Jefferson’s striking portrait is brilliantly framed in gold. The official seals of the Federal Reserve and the United States Treasury are present to attest to each bill is legal tender. The other side of the bill has one of the most important events ever in American History, the signing of the Declaration of Independence. Each $2 bill comes with an individually numbered certificate of authenticity along with beautiful park photos. 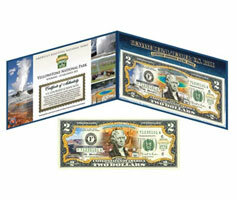 Order the Yellowstone National Park $2 Bill for only $10 plus the cost of shipping and handling. As a special bonus, you’ll also receive the Grand Canyon National Park $2 bill with your order for free. You just have to pay the addtional shipping for it. 4 Comments on "National Park Two Dollar Bills"
before I start collecting these items, how many in total will there be? I don’t want to start to learn that I can’t afford to continue. How many total will there be???? They are going to make 50 different bills for 50 different parks.